How to work with fill and stroke color? This post will explain the differences between 'fill' and 'stroke' color, how to switch between the two, how to change the color of each, and other dynamics of the 'fill / stroke toolbar'. If you're not quite sure what I am talking about, you're in the right place! Lets start with some clarifying remarks, when I refer to the 'fill / stroke toolbar' I am referring to the image directly below this text. As you can see there are two 'boxes' within the image which I will henceforth refer to as 'fill box' and 'stroke box'. The grey color is the 'fill' color, and the transparent box is the 'stroke' color. Now that we know this, what does 'fill' and 'stroke' color actually mean? Well, I am glad you asked. The fill is the color inside the shape, and the stoke is the visible outline of the object or path. Lets use some examples to illustrate this. Above we see two objects with fill color. As you can see there is no outline around the object, or in other words, no stroke color. Lets see what happens when we remove the fill color and only apply a stroke color to the image. And now with both fill and stoke color. As you can see, the 'fill / stroke toolbar' in the top left corner is different in each image. When you change the color of an icon it is important to understand beforehand if you're trying to change the fill color or stroke color of the object currently selected, and then choose accordingly from the toolbar. Click on either the 'fill' or 'stroke box' depending on what you are trying to edit, this will bring the 'box' to the front (see image above). Click on the box again to prompt the color picker. Lets demonstrate this with a short video. 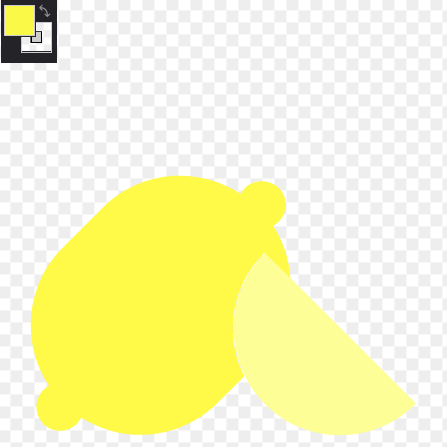 When we changed the stroke color of the lemon you were perhaps surprised that the stroke color of the 'piece of lemon' did not change as well (or only half of it did). 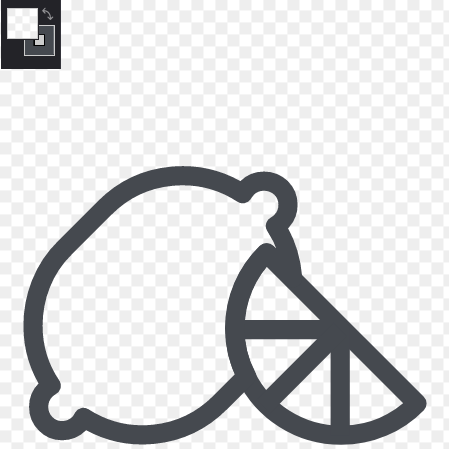 However, as we saw the outline of the lemon is drawn with the indented curvature in mind, so while it is perhaps confusing, the way the outline changed color, was correct. This could also be seen when we moved the 'piece of lemon' away from the lemon illustrating the indented curvature of the outline of the lemon, and also that the 'piece of lemon' had its own outline around the whole shape. Knowing this, we could again follow the 5-point step outlined above; select the outline, bring the 'stroke box' to the front, click on it again, choose the desired color, and press "OK". We saw this 'issue' again when editing the three lines which split the 'piece of lemon' into four equal parts. Since, the strokes were not grouped together we had to edit them independently and then arrange them again, however, the process was again the same (the 5-point steps). This 'issue' occurs because of the way the icon is designed. You are likely to run into similar issues when editing icons on your own. If there is one thing I would like you to take away from this article, it is that following the 5-point plan and being intentional about which shapes you are editing, and making sure 'fill / stroke toolbar' is adjusted correctly will ultimately save you a lot of head scratching. Some designs will require you to be inquisitive, as the example with the lemon above demonstrated, for example by moving the piece of lemon away from the rest of the design to recognize that it is a shape in itself. My hope is that this article has cleared up any unnecessary confusion when changing colors with the fill and stroke toolbar. Here is a link to the icon used in this article. Try to see if you can recreate the images above, or try something completely different! As they say, practice makes perfect.